One of the most remarkable – not least by virtue of being the oldest known – of the scarce fleet of surviving yachts from yacht designer G.L. Watson’s lifetime is the 27ft gaff cutter Spartan. 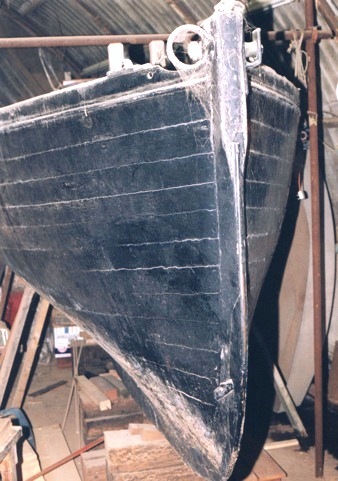 She is in the care of east coast of England boat builder, Jamie Clay, who makes a habit of rescuing old yachts of a certain pedigree from the ignominy of death by chainsaw and/or funeral pyre, followed by skip burial. Jamie is on the lookout for a client interested in working with him on the unique opportunity to restore a truly authentic masterpiece of 19th Century yacht designing and building. Spartan, G.L. Watson design number 97, was built by J.E. Wilkins at Wivenhoe, Essex in 1886. As with many of Watson’s clients for yachts large and small, 51 year-old Dr W. Arnold Smith-Wynne of St. Olave’s Priory near Great Yarmouth, Suffolk, had led an interesting life – prior to commissioning Spartan in retirement – as Deputy Surgeon-General in the Indian Army during turbulent times. But that’s another story. Jamie reports that Spartan’s logs, which have remarkably survived, record that her designer sailed aboard during Oulton Broad Regatta in the autumn of 1886. Was it a medical connection through Watson’s father that enticed the otherwise workaholic yacht designer to travel so far from Glasgow to sail on a relatively small yacht in the south east of England, when he was presumably deeply involved in design preliminaries for the 1887 America’s Cup challenger, Thistle? Or was it the fact that Dublin wine merchant, and pioneer of the yacht racing rules, George B. Thompson, had commissioned a state of the art 10-Rater racing yacht from Watson, to beat the redoubtable – almost unbeatable – Doris (1885), also designed by Watson? How do Glasgow, Dublin and Wivenhoe triangulate? Well, the result of Thompson’s commission was the 10-Rater, Jess, built by none other than Spartan’s builder, J.E. Wilkins, of Wivenhoe, during the winter of 1886-87. We can safely speculate that Watson’s visit to the south east of England was strictly business. More on Wilkins and Wivenhoe to follow, together with, we trust, news from Jamie Clay of Spartan developments. Meanwhile check out his Spartan page. For beautifully illustrated tales of G.L. 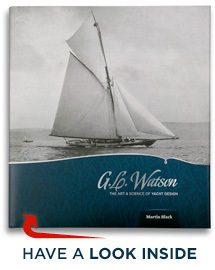 Watson’s state of the art racing yachts, like Doris and Jess, and their colourful owners, buy the book here. And keeping nice connections flying, George B. Thompson features strongly in Peggy Bawn Press’s imminent new publication Dublin Bay – The Cradle of Yacht Racing by Hal Sisk. Watch this space. This entry was posted in America's Cup, boatbuilders, G.L. Watson, G.L. Watson clients and tagged George B. Thompson, J.E. Wilkins, Jamie Clay, Spartan, Thistle, W.A.S. Wynne, Wivenhoe. Bookmark the permalink.